Amazon.com description: Product Description: In a changing climate, livestock production is expected to exhibit dual roles of mitigation and adaptation in order to meet the challenge of food security. 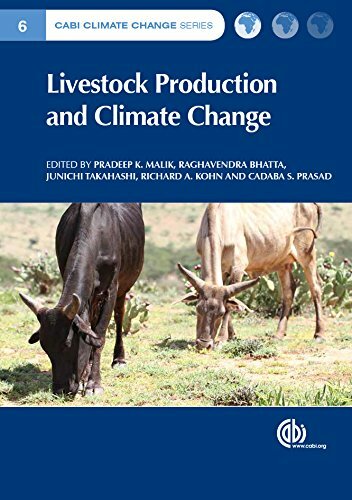 This book approaches the issues of livestock production and climate change through three sections: I. Livestock production, II. Climate change and, III. Enteric methane amelioration. Section I addresses issues of feed quality and availability, abiotic stress (heat and nutritional) and strategies for alleviation, livestock-generated nitrogen and phosphorus pollution, and approaches for harnessing the complex gut microbial diversity. Section II discusses the effects of climate change on livestock diversity, farm animal reproduction, impact of meat production on climate change, and emphasizing the role of indigenous livestock in climatic change to sustain production. Section III deals with the most recent approaches to amelioration of livestock methane such as breeding for low methane emissions, reductive acetogenesis, immunization/vaccine-based concepts and archaea phage therapy.